1 stamped glass candy dish 7"H x 6" Diam. Housed in a clear blue vintage candy dish, this delicate arrangement makes a perfect centerpiece. The blue candy dish is nicely offset by the pink and white of the roses, and the lacy green seeded eucalyptus. The Dragon Wing Pink Begonias anchor each end of the arrangement like a pair of drop ear-rings. 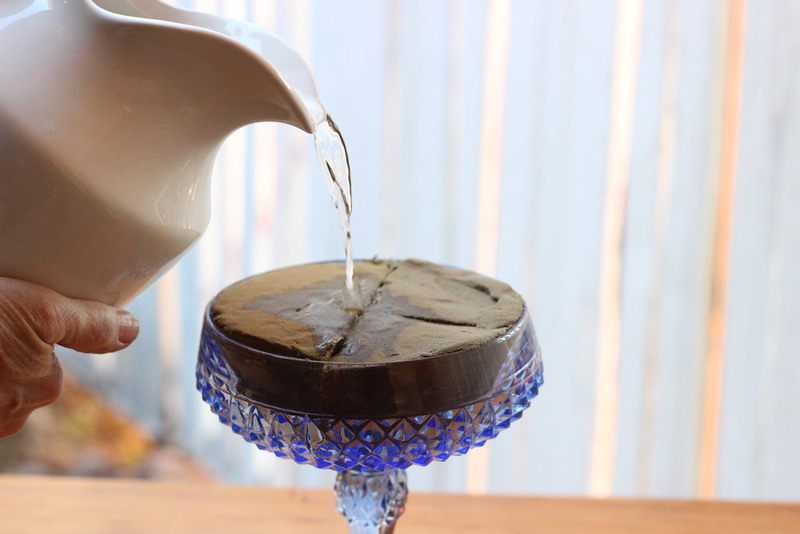 Get out Mom's blue pressed glass candy dish, or go treasure hunting at the 2nd hand stores. You can grow the Dragon Wing Pink Begonias in the shade of your garden, then take a snip or two as needed. The hydrangeas give it volume and shape as well as an accent color. 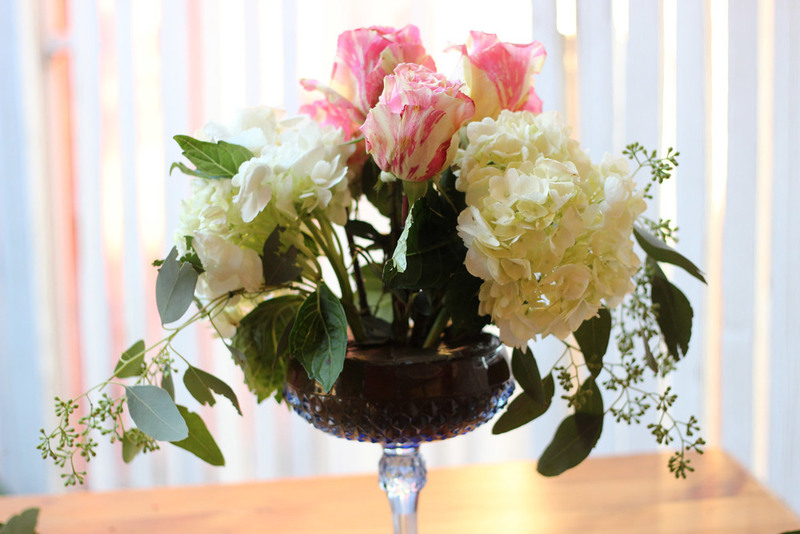 As you place the hydrangeas and roses in this arrangement, they form a sphere starting from the base of the candy dish. If you can image the entire arrangement forming a triangle, the Dragon Wing Pink Begonias form the bottom vertices or points of a triangle. The horizontal proportions follow the Greek rule known as the "Golden Mean," a ratio of 1/3 to 2/3rds. That is, the candy dish takes up 1/3 of the width of the arrangement. Cut tiny bit off stems. Leave in water until used. Wire roses. See "My Best Secrets" for directions. 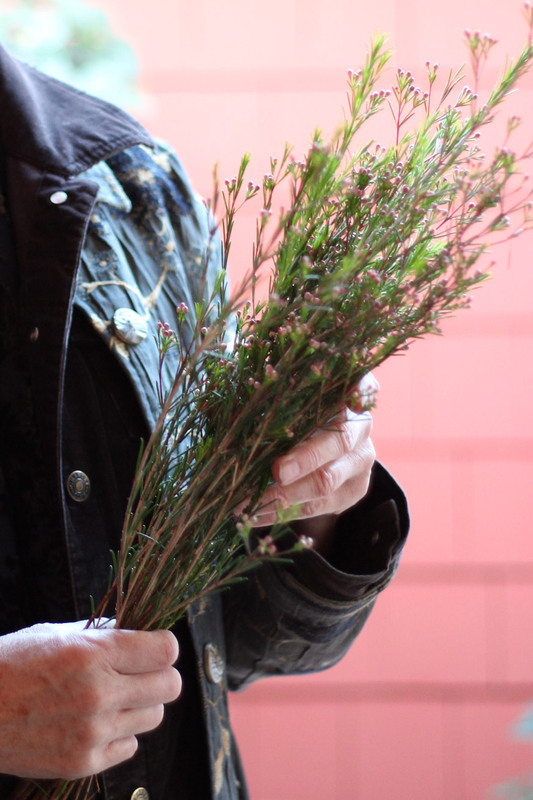 Use a few pink wax flower stems with buds. Cut floral foam to fit half of dish. Press it into foam to get shape, then cut it. Copy shape and cut a second piece. Put both in candy dish. Add water until saturated and it is a little below brim of bowl. Put seeded euc. that are same size and droop same way on each side. Wire the two pieces the way you want them to hang. Cut 2 hydrangea pieces about so. Place 1 in front right at angle going out and to right like so. Add 1 on back, mirroring front. 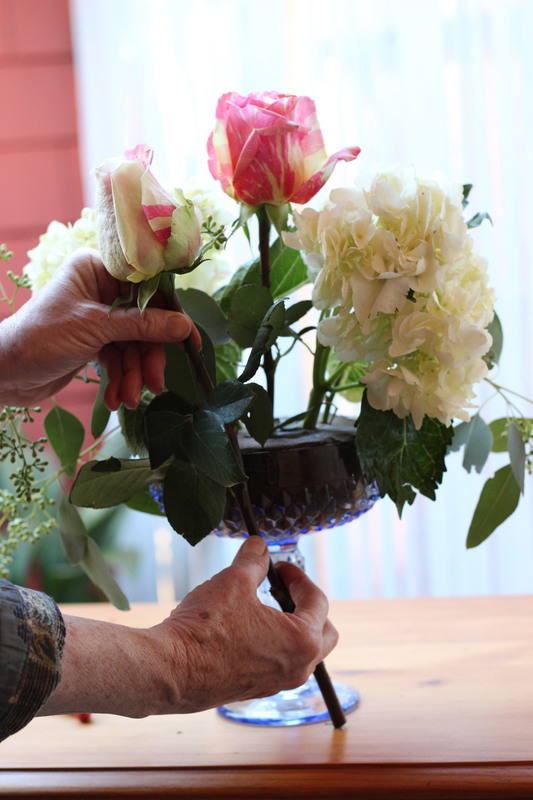 Add center rose with it 1.50 inches higher. Measure and cut 2nd rose. Put in at angle shown. Add candy cane roses at same angle around center rose. 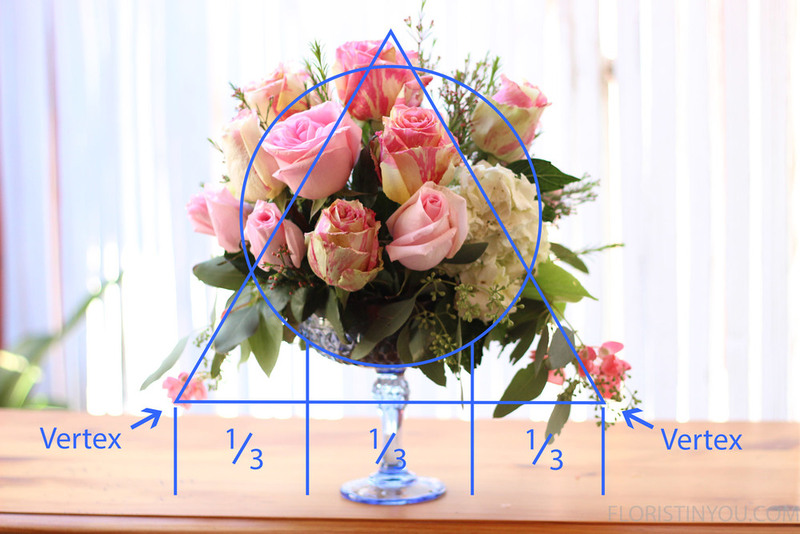 Cut roses shorter as you go, so arrangement is rounded. 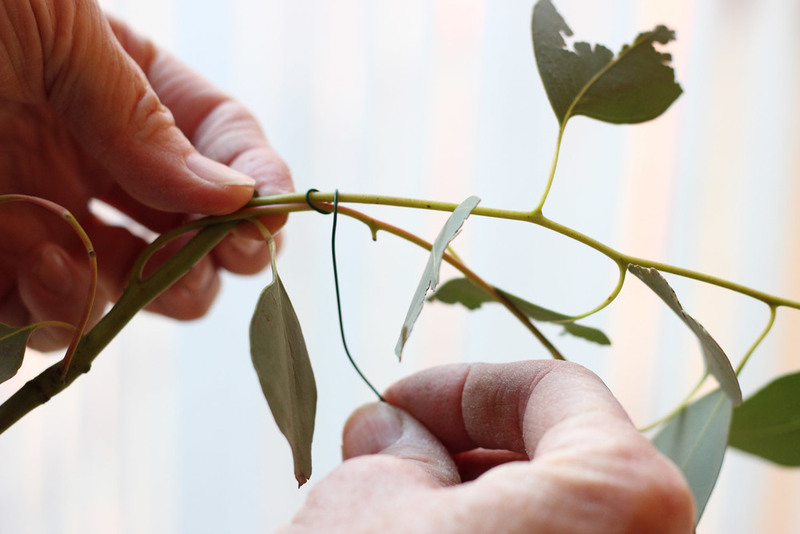 Guide placement of wax flower buds with your hands. Finish with Dragon Wing Pink Begonia on each side. This is the finished arrangement.